So much fun, our Thursday night weekly urban hiking and conversation walk fell right on Hallowe’en this year. Naturally, we went for an urban walk to a particularly popular Hallowe’en destination in Mile End. Tons of kids running around in costumes, parents, intricately-carved pumpkins and creatively-decorated homes. 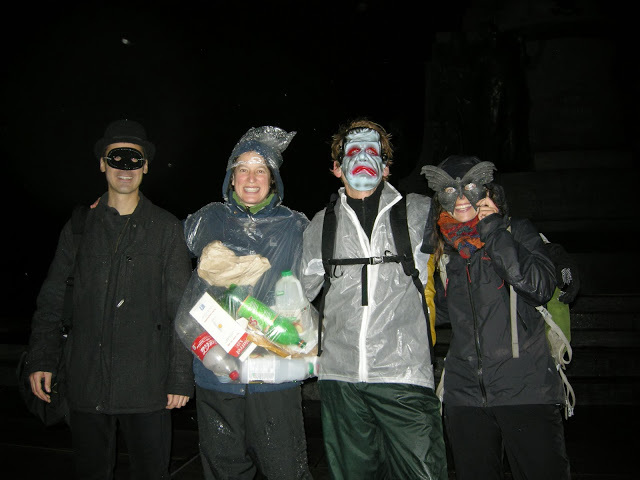 A few of us wore costumes as well (someone said I should become a mascot for Recyc’Québec!). Some brought along candy to give out. It’s great (and rare) to have an excuse to interact with neighbours and kids, and to have the chance to get creative and silly with costumes! Previous articleEscalader le mur à Dawson! Next articleCalendrier de kayak pour ramasser des fonds!